There are more bicycle riders on the streets of Boston and in the City of Cambridge just across the Charles River than ever before. There are variety of reasons for this. Some people just want to get some exercise, and, as most of our jobs involve sitting down for most of the day, that is getting harder and harder to do. One way to get some exercise is to ride a bike to work. Another reason more people are riding bikes is because it is much better for the environment than driving or even using public transportation such as the T. It is also a lot more cost effective once you foot the bill for the bike itself. You no longer have gas to buy, and, for most people, you don’t need a $6,000 bike ready for the Tour de France.Finally, both Boston and Cambridge have become much safer and friendlier to those riding bicycles. There are more bike lanes than ever before, and there are also more laws on the books to protect bike riders. For example, you can to go to MassBike.org and see a comprehensive list of the rights and responsibilities that apply to you as a bike rider in the Commonwealth. As our Boston bicycle crash lawyers can explain, as a bike rider you have a right to ride your bike on any public way (public street, road, or bikeway) in the city unless they are specifically marked that bicycles are not allowed or that only motorized traffic is allowed. This is generally only reserved for areas such as major highways and interstates where it is simply not safe to have pedestrians and bicycles when most vehicles are traveling at around 60 to 70 miles per hour. You have the right to ride on sidewalks unless you are in a business district or the area is specifically covered under a local law that prevents bike riding on the sidewalk. There are enough bike advocacy groups these days that can help you learn good and safe places to ride your bike. Another right you have is to have any number of lights and reflectors that you so desire. This means that you can have a minimal number of reflectors or your bike can essentially be a one-person light show. While we could go into every right and responsibility covered by the laws, the point here is that you have rights as bicycle riders even if some drivers do not think you have, or want you to have, these rights. Across the nation, trucks are a serious danger to bicycle riders and pedestrians, as discussed in a news article from Street Blog USA. However, it should be noted that this is not an indictment on truck drivers or the trucking industry in general. We understand that truck drivers are doing a difficult job, and most are responsible and trying their best to make sure nobody is injured. What we are talking about here is how to make trucks safer for bicycle riders through the use of a side guard to prevent bike riders and pedestrians from being pulled under the truck and getting crushed by the wheels. This is one of the more common accidents in which pedestrians and bike riders are killed, and when it happens with the rear wheels of a semi-tractor trailer, it is possible that the truck driver doesn’t even know he or she has hit a rider, as this type of crash commonly occurs when the truck is going around a turn. The article involves an interview from a researcher with the U.S. Department of Transportation (DOT) who conducts and compiles research for the purpose of making policy recommendations. One of the areas he looks at is how trucks are designed and how they can be better designed to save the lives of bike riders and pedestrians. One thing to keep in mind is that, while states can regulate what roads a truck can ride on, and whether doubles or triples are allowed, they cannot regulate what equipment can be a truck that is being used for interstate transit. This is because the Interstate Commerce Clause (ICC) of the U.S. Constitution sets forth that only Congress has the power to regulate interstate commerce. This means that states generally cannot do so. There have been various cases in the U.S. Supreme Court on this issue since the founding of our county, with one major case going back to the time of steamships. However, the case that controls whether a state could require side guards would probably be Bibb v. Navaho Fright Lines, Inc., 359 U.S. 520 (1959). In this landmark legal decision, Illinois had a law that required all trucks to have a curved mud flap if they were driving in that state. There was no federal law at the time. Arkansas, however, where the truck was registered, had a law requiring straight mud flaps, and 45 other states had a law that allowed for these types of straight flaps, thus they were legal. The law in question meant that when a truck that was driving across the country entered Illinois, the driver would have to get out and remove the straight ones and put on the ones allowed in Illinois. This would obviously create a hardship on the truckers, and because Congress is supposed to control interstate commerce, the court struck this law down. This is the reason a state like Massachusetts or the City of Boston could not likely require side guards on all trucks. The reasons states can regulate the number of trailers, such as doubles and triples, is because they can easily drop a trailer and have another cab pull it if they see fit. For this reason, those advocates for bicycle safety are arguing for a federal DOT requirement for side guards to prevent serious bike crashes and fatalities. 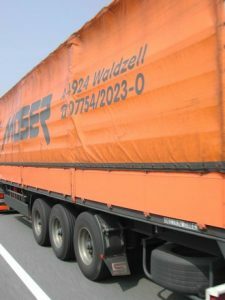 Research shows that nearly half of all bike riders and around a quarter of pedestrians hit by a truck were hit by the side of the truck first. This is because it is a major blind spot for the truck driver, even if they have extra mirrors aimed at the side of the truck. With a side guard, the bike rider might still be injured but would not likely but pulled under the wheels, which often results in serious personal injury or even death.